What a pretty kitty! Yogi looks like a Fancy Feast cat! Those green eyes! 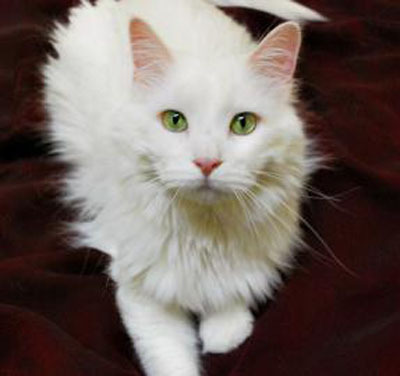 Yogi is a 4-year-old male cat with beautiful green eyes and a fluffy white longhaired coat. He is at our adoption location at The Mall at Greece Ridge! Yogi came to Lollypop Farm because his previous owner felt he wasn’t getting the attention he deserves. This sweetie enjoys attention, especially being brushed and petted! He is an active cat who loves to play and explore. If you’re looking for some laughs and someone to liven up the party, Yogi is sure to please. Come out and meet Yogi at The Mall at Greece Ridge, located in store #168 near mall entrance #3, near Regal Cinemas and the Rochester Athletic Club! What are you waiting for? Sydney, the dog from last week was adopted!